Shopping for art supplies can be overwhelming, especially with regards to paintbrushes. There are literally hundreds of options when you consider the various styles and brands available on the market. 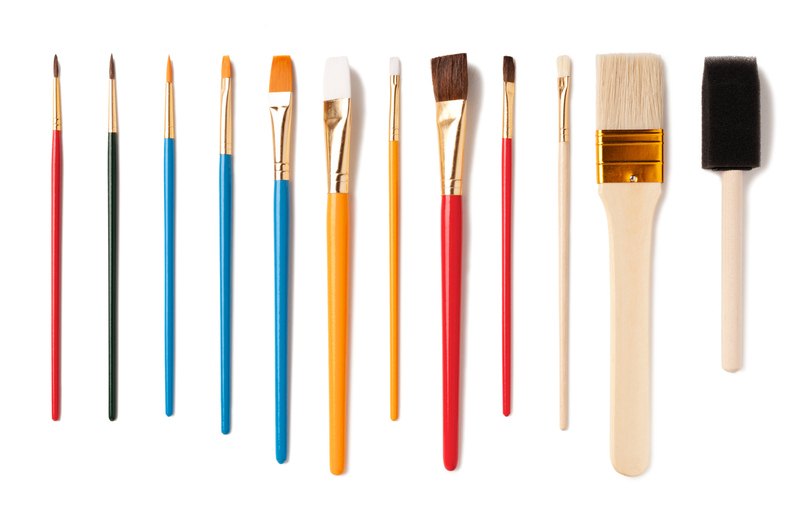 This guide was written to help you make better-informed decisions when shopping for paintbrushes and to provide some recommendations from artists around the world. The graphic below outlines the six most commonly used paintbrushes, organized by shape. In the left column, you’ll find a brief description. In the right column, you’ll find a list of variations. These are divided by the fiber used in the brush and media (oils, acrylics and / or watercolours). Paintbrushes have traditionally been made with animal hair. The best are made with hair from the kolinsky sable, a species of weasel native to Asia. Other animals whose hair is used to make paintbrushes include the red sable, ox, camel, pony, goat, mongoose, squirrel, badger and hog. Some of these animals are more rare or difficult to obtain, so their hair is more expensive. For example, the fitch, sable and mongoose are all wild animals that have to be trapped, whereas the ox and the goat are domesticated animals. Many brushes are a blend of rare and less expensive varieties of hair. One common combination is sable and ox hair brushes. Synthetic bristles made from nylon filament or polyester are also quite common. These synthetic fibers usually mimic the look and feel of animal hair, so they are often referred to as synthetic bristle, synthetic sable, etc. Brushes used for watercolour painting are most often made from sable hair, synthetic sable hair or nylon. Oil brushes are usually sable or hog hair. Acrylic brushes are almost always made of nylon or synthetic fibers. However, the type of brush used for each media is often more of a personal decision and can vary from artist to artist. Additionally, a brush handle can be short or long. Short-handled brushes are more common for watercolour painting, while long-handled brushes are better suited to oil and acrylic painting. The handles themselves are made of wood or molded plastic. The highest quality brushes have handles of seasoned hardwood. The piece of metal used to connect the bristles to the handle is called a ferrule and is made of aluminum, nickel, copper or nickel-plated steel. In this guide, we’ve listed one or two favourite products for each of the 25 variations listed in the graphic below, with pros and cons gathered from consumer reviews and input from the artists of the WonderStreet community. A section for specialty brushes, is included at the end of the guide. In reality, there are hundreds of brushes available on the market and at least 10 different brands to consider for each of the categories that we have included in this article. We are not connected to any of the brands represented and have based our selections on common consensus. We invite you to tell us more about your favourite styles and brands of paintbrushes in the comment section below this article. For acrylic and oil painting, the Escoda Modernista Tadami Angular brush is a favourite because it maintains its stiffness, even after heavy use. PROS: It is made with synthetic mongoose filament that simulates the feel of mongoose hair and is stiffer than most other synthetic brushes. CONS: The point of the brush can become less sharp over time, making it more difficult to reach tight corners in a composition. The Escoda Perla Toray White Synthetic Angular is recommended by watercolourists for its ability to hold colour. PROS: Several reviewers mentioned that it is quite easy to wash.
CONS: The white bristles do become stained after use, and though this doesn’t affect the overall quality of the brush or the application of paint, the stains on the bristles are not aesthetically pleasing. The Blick Studio Decorative Angular is noted for its ratio of quality to price. PROS: It is very affordable and provides good control for detail work. The bristles are also quite long from the ferrule, which means that the brush can carry a lot of paint. CONS: The brush does tend to wear down and lose its shape faster than most high-end products like those made by Escoda or Princeton. For oil painting, the fibers available in bright brushes are badger, bristle (hog hair), fitch, mongoose, sable, synthetic bristle and synthetic sable. Bristle, synthetic bristle and synthetic sable are well-suited to acrylic painting and sable, squirrel and synthetic sable are recommended for watercolourists. The Blick Masterstroke Interlocking Bristle Bright is one of the most popular brushes made with bristle fibers. PROS: They provide good value and an acceptable product that holds up even after extended use. CONS: Some artists reported that the brush has some issues with stray or loose hairs and that the quality can be somewhat inconsistent. Though quite expensive, the Isabey Pure Kolinsky Sable Bright offers top-of-the-line quality in the sable category. PROS: The bristles do not separate and the brush maintains its edge over time. CONS: The brand and pure Kolinsky Sable fibers are quite expensive, which may be a limiting factor for the artist on a budget. Brushes made with synthetic, imitation Kolinsky Sable fibers are more affordable. The Princeton Series 6300 Dakota Synthetic Bristle Bright is a remarkably durable brush that some artists reported using for over 30 years. PROS: It keeps a nice edge and maintains a perfect balance between stiffness and softness. CONS: This brush can be a bit more difficult to clean, but a good quality cleaner should take care of any stubborn pigment. The Escoda Versatil Bright is the best synthetic sable alternative because of its very fine tip. PROS: If you’re thinking of buying this brush to paint with watercolours, you’ll be happy to learn that it holds water very well. The hairs are also a bit longer than most other brushes in this category, which allows for extra flexibility and makes it possible to create long, even strokes. CONS: Like many synthetic brushes, the lifetime of the Escoda Versatil Bright is not as long as the brushes made with natural fibers. The Princeton Series 3750 Select Bristle Fan is great for adding texture to a composition. PROS: It blends colour quite evenly. CONS: However, the bristles are very fine and are damaged easily, so it is recommended to keep a brush protector on this product when it’s not in use. The Grumbacher Bristlette Fan is stiff and sturdy and provides a vegan alternative to the natural fiber Princeton Series 3750 Select Bristle Fan. PROS: The price is very reasonable and it maintains its shape well. CONS: Certain pigments are difficult to clean off of this brush. The Utrecht Manglon Synthetic Fan brush can be used with every variety of media, so it’s a great option for the versatile artist who likes to experiment. However, it’s important to remember that a brush used to paint with oils and cleaned with solvents cannot be used with acrylics or watercolours. PROS: The Utrecht Manglon Synthetic Fan brush is flexible and holds paint well. CONS: The dimensions listed by the manufacturer are not always accurate, so keep this in mind if you need a handle of a particular length. The Utrecht Natural Chungking Pure Bristle Filbert is a much stiffer option because it is made with hog bristle rather than fine hair. PROS: It holds its shape for many years and is a very affordable option. CONS: The overall quality is not as high as some of the other professional grade brands. Some reported that the brushes shed, or lose their fibers. The Silver Brush Monza Synthetic Mongoose Short Filbert has a short handle, which makes it easier for the artist to get in close to his or her composition to add detail. PROS: It holds a heavy load of paint and blends well. CONS: The brush is not as wide as some of the other products in this category, which may be a con for artists who are looking for a brush that provides a lot of coverage. Consider the Da Vinci Black Sable Filbert as an alternative. The top brand in this category is the Princeton Siberian Kolinsky Sable Filbert, because of its softness and long life. PROS: This brush is made with fibers from the Kolinsky Sable, which have been prized by artists for many centuries. CONS: Some artists complained that the handle on this brush is longer than what is typically used for watercolour painting, so it is better suited to oil painting. The Robert Simmons Sapphire Filbert is a better choice for watercolour painting. As with the bright category, the Princeton Series 6300 Dakota Synthetic Bristle Filbert is a favourite with our audience. The Princeton Series 6100 Synthetic Bristle Filbert is also a top quality brush. PROS: The Series 6100 brush is quite stiff and very durable with a tight ferrule. CONS: The bristles can lose their shape over time, so it’s important to re-shape them after every cleaning. The Raphaël Kaërell Filbert offers versatility and a reasonable price for a professional grade synthetic sable brush. PROS: The ferrule is tight and it’s not common for the brush to lose fibers. CONS: The brush does not hold its shape and stiffness as well as some of the other brands in this category. Some oil painters noted that it also doesn’t provide the snap that they prefer to have in an oil brush, so it might be better suited to acrylic and watercolour painting. The Robert Simmons Signet Flat / Broad is one of the top-rated brushes in this category and is more reasonably priced than similar brushes by Isabey, Escoda and Princeton. PROS: The brush holds up well and cleans easily. CONS: The edge is not as sharp as some artists would like in a flat brush. Rosemary & Co. Ivory Long Flats are manufactured by hand by a small company that is quite beloved by many artists in our community because of its commitment to producing high-end products and providing excellent customer service. Though Rosemary & Co. makes many great paintbrushes, we've highlighted just a few favourites in this article. We mention them in this section because this particular brush receives rave reviews. The Old Holland Kolinsky Sable Flat offers a high-quality natural fiber brush from an established and well-respected brand. PROS: If cleaned properly, this brush can be used for more than 10 years. It holds its shape and spring well and, though it is recommended for use with oils and watercolours, it also comes very highly recommended from a number of acrylic painters. CONS: Old Holland is more expensive than many of the other brands in this category, but many artists noted that you do get what you pay for with the Old Holland Kolinsky Sable Flat. The Raphaël Soft Aqua Flat holds water better than conventional synthetic fiber brushes because of the unique “wavy” shape of the fiber, making it a favourite among the watercolourists of the WonderStreet community. PROS: This brush glides smoothly across the surface of the support and the ergonomic design of the handle feels nice in the hand. CONS: Some artists were not happy with the “wavy” structure of the fibers and complained that the brush does not hold its shape well. The Silver Brush Black Velvet Flat Wash is very affordable and is considered by many to be a real workhorse of a brush. PROS: It can carry a large quantity of water or paint and has a very nice spring to the bristles. It also holds its shape well. CONS: There are some issues with loose hairs, which can fall out during use and cling to the composition. For acrylic painting, Robert Simmons Titanium Flat offers the perfect balance of stiffness and flexibility. PROS: It keeps its shape and spreads media evenly, whether the media is oil, watercolour or acrylic. This brush is also reasonably priced. CONS: One artist observed that the ferrule is not always attached properly to the handle and one stated that the sharpness of the edge was not sufficient. As with the bright category, one of the best-received round bristle brushes is the Blick Masterstroke Interlocking Bristle Round. PROS: The brush provides good value and an acceptable product that holds up even after extended use. CONS: Some artists reported that the brush has some issues with stray or loose hairs and that the quality can be somewhat inconsistent – some interlocking bristle brushes from Blick perform better than others. The Escoda Modernista Tadami Round provides all of the same benefits of its angular brush. PROS: It is made with synthetic mongoose filament that simulates the feel of mongoose hair and is stiffer than most synthetic brushes. CONS: The point of the brush can become less sharp over time. The Escoda Reserva Kolinsky-Tajmyr Sable Round and the Raphaël Kolinsky Red Sable Round offer the highest quality natural fiber brushes and are very well rated by watercolourists of all skill levels. PROS: Both hold a sharp point, even after extensive use. CONS: Both brands are quite expensive, but reviewers noted that you “get what you pay for” with both products. Rosemary & Co. Pure Kolinsky Pointed offers the same great quality at a more reasonable price if you're willing to do your shopping online. The Princeton Umbria Round is a bristle brush that leaves behind a very pleasing feathery trail of paint. PROS: The bristles are soft and easy to clean and the entire brush has a very solid and durable construction. This is one of the highest rated brushes in our entire guide! CONS: The price reflects the quality of this brush, so it is quite expensive. The Da Vinci Cosmotop Spin Round is an excellent representative of the synthetic sable category. PROS: It has a great spring and lays the paint out quite evenly on the support. This brush is also a beloved favourite. CONS: Again, the price of this brush is high, but so is the quality. For a high quality script liner, consider the Da Vinci Maestro Kolinsky Special Inlaid Liner, which has a needle-like point perfect for fine detail work. PROS: It allows the artist to make beautiful, uninterrupted lines of paint. CONS: It is quite expensive and fragile, meaning that it may be necessary to replace this brush frequently. In addition to the six styles of brushes that should belong in any artist’s set of tools, there are also many “specialty” brushes that can be used to create a variety of different effects. We’ve listed seven of the most common specialty brushes below. 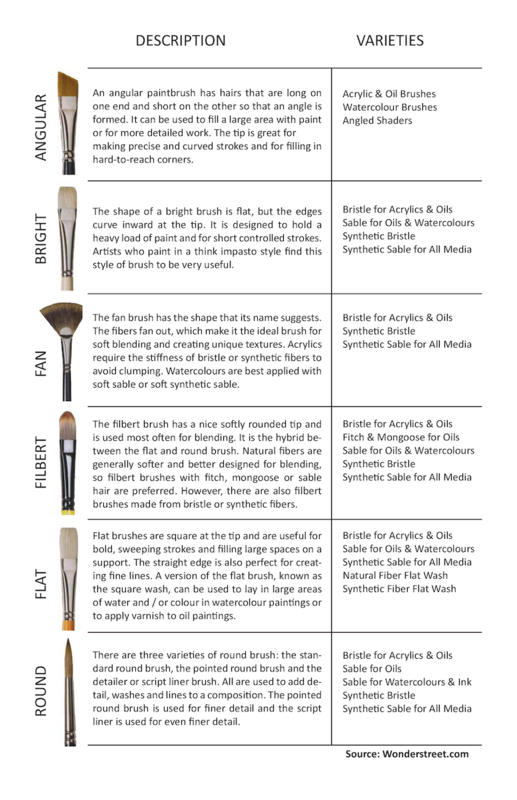 As with the six standard brushes, we’ve included a description and a brief review of the best brands available. A hake is a special brush used in traditional Oriental-style watercolour painting. It is unique because it has a flat wood handle. It has the ability to hold a lot of water and fill in large areas of a composition. Traditionally, these brushes were made with sheep or goat hair. Modern products also utilize squirrel, ox, bristle and synthetic fibers. The Yasotumo Hake Brush is handmade from extra soft sheep’s hair, which is stitched and connected to a split handle, which can be divided into three smaller sections to meet the artist’s specific size requirements. Princeton and Blick also offer hake brushes, but they are not as well reviewed as the Yasotumo brand, which provides an unparalleled level of softness. One drawback is that the brush tends to “shed” a lot and lose hairs. A highliner is similar to a script liner, a type of round paintbrush that we covered in the previous section, because it can be used for extremely delicate detail work. It has extra long hairs and a short handle, but the tip is square rather than pointed. Highliners are often used with ink and are made with red sable, ox or kolinsky sable hairs. The Kafka Design Pinstriping Brush is good for making straight lines, but some artists noted that it does not handle curves very well. Artists of every skill level can use this brush. The mop is a very round and very full brush used to lay in large areas of water or colour. The tip comes to a point and the fibers are either goat, squirrel or synthetic. It is very well-suited to watercolour techniques and can be used to wet the surface of a support or to absorb excess liquid. The Isabey Pure Squirrel Mop Pocket Brush and the Raphaël Pure Squirrel Mop both received excellent reviews, proving that natural fibers are best when it comes to mop brushes. Isabey’s brush is a perfect size for traveling, but it still holds a very impressive amount of water or medium. Raphaël’s product also holds liquid well and comes to a nice point, which makes it easy to use the brush for finer detail work. If you’ve ever painted the trim in your house, you’re familiar with the shape of a mottler brush. The bristles have a flat edge and the handle is also flat and generally made from untreated wood or plastic. It is generally quite wide, so it is best used to apply all-over colour in large areas of a composition, for murals and faux finishing techniques or to apply primer or varnish. It is not suitable for detailing. Pony, goat, hog and squirrel hair are all common materials. Synthetics are also quite popular. Though these brushes can be purchased at any hardware or hobby store, artist quality products are also available. Da Vinci’s line of mottlers includes the Da Vinci Cosmotop Spin Flat Wash, made from synthetic fibers, and the Da Vinci Russian Blue Squirrel Mottler. Both are well made and are routinely praised for their ability to hold water and pigment. This product gets its name from the ability to create block letters with just one stroke of the paintbrush. The end is square and it typically has a short handle. It’s very useful for sign lettering and can be used with acrylic or oil paint or with ink. Some one stroke brushes are designed specifically with lettering in mind, including the Da Vinci Nova One Stroke, which is a high quality synthetic prized for its holding capacity and for not being too stiff or too soft. The Winsor & Newton Artist’s Acrylic One Stroke is appropriate to use with thicker media and provides a good value for the price. The brush is versatile, flexible and comfortable in the artist’s hand. An oval wash brush has a very rounded appearance and looks very similar to a makeup brush. It is used exclusively for watercolour painting and has the function of laying in large areas of colour or water. Natural fibers include sable and squirrel. Synthetics emulate the feel of extra soft sable and squirrel hair. The Princeton Series 3750 offers both a Select Synthetic Oval Wash / Mop brush and Select Round Blender made with squirrel hair. Unlike most brushes, which have a metal ferrule, the quill brush has a ferrule made of either plastic or natural quill. It has long badger, squirrel or synthetic hairs and is most often used for lettering. It can be used to paint on smooth surfaces, such as glass. There are three brands preferred by the artists in our community: Da Vinci Russian Blue Squirrel Quill, Princeton Neptune Synthetic Squirrel Quill and – always a favourite – Raphaël Soft Aqua Quill. All three hold their points well and are responsive to the artist’s touch. What kind of brushes do you use for your artwork? Please let us know in the comments section below.